For anyone interested in woodturning, making some file handles is a great entry project! 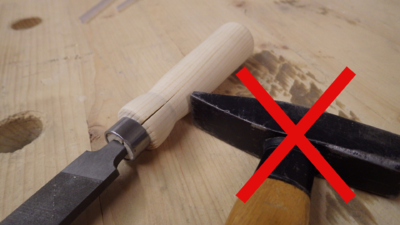 We have a bunch of naked files in the metal workshop, and if a poorly made handle should break while filing there is no real risk, much different to some other tool handles you could try to make once you're more experienced. What you want to have in the end are basically three features: the handle should feel nice and not break, and the file should be somewhat balanced. Feel: This part is rather simple - just turn and remove material until you are happy with the handle's shape! You can also take existing tool handles you like as a guide, of course. In the end you should give it a nice sanding so nobody gets splinters from using your handle, ideally you'll do this while the piece is still on the lathe. Stability: Harder wood might help a bit, but every handle is in danger of splitting when you drive in the file! To prevent ruining your precious piece, include a ferrule (Zwinge) in the design. 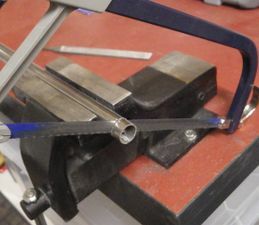 You can make one very easily by just cutting and filing a piece of metal pipe, it should have a wide enough diameter for the file shaft and some wood around it. More experimentation is needed, but about 3x the file shaft diameter might be a good measure. Balance: Make sure the hole you drill into the handle is nice and straight, and the file can be inserted sufficiently. If it does not go in deep enough, widening the hole may be an option. In a first try with fir wood, the mean diameter of the file shaft was a good drill diameter. try it yourself (mouseover/click for explanations)! This page was last edited on 30 September 2018, at 20:57.